I love Oxford. 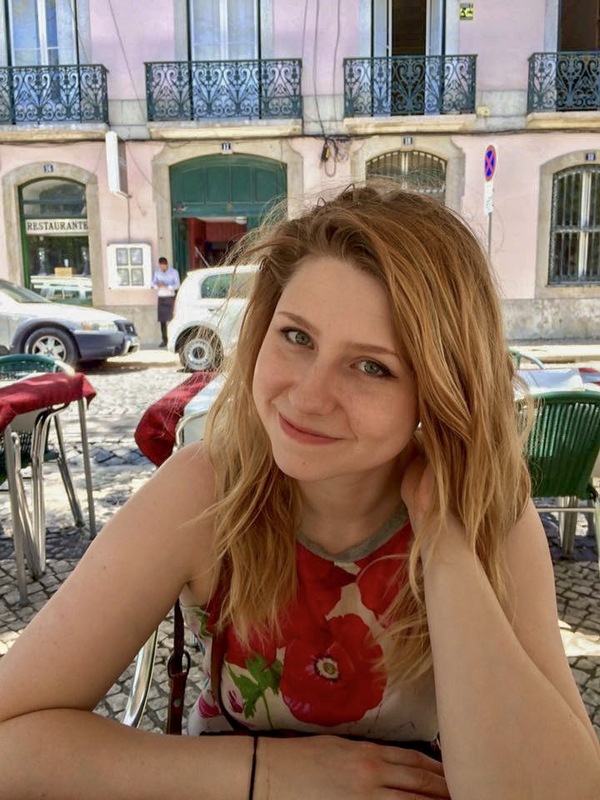 My sister Rosie studied Spanish & French at Exeter College, and my boyfriend Matt did History at Somerville (look out for some great History facts from him in this post). After that my friend Kerry studied at Oxford Brookes, then coached the rowing team at Magdalen, and one of my oldest friends Emma now lives in Headington and works at the hospital. So I’ve been to Oxford many times over the years, and been taken to all the best haunts. Walking along Oxford High Street. One of my favourite things about Oxford is that all the streets are picturesque, even the back alleys. 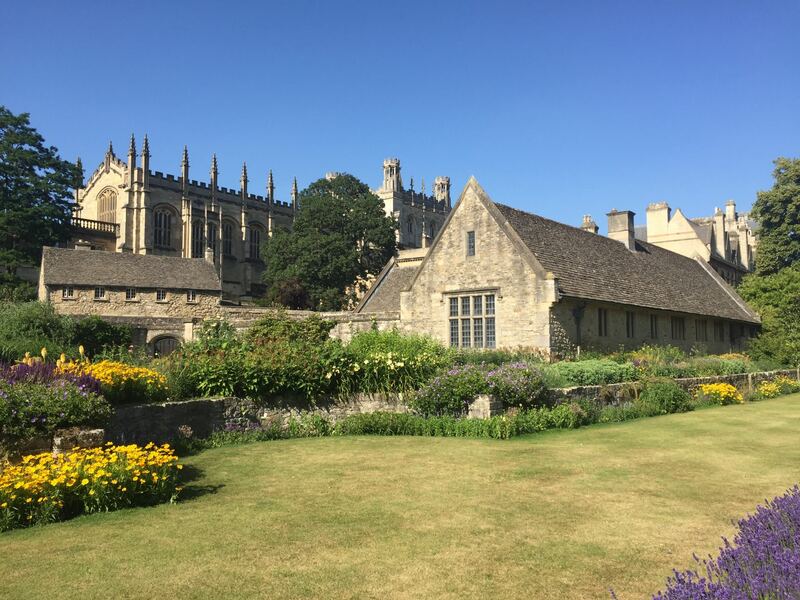 There are colleges all over the place, as well as churches and museums, all of them working together to make Oxford one of the most beautiful cities in England. Left: University Church of St Mary. Right: Brasenose College. Of course there’s absolutely shedloads to see and do, but here is a short list of my favourite places. I’ve enlisted the help of my friend Dan, photographer and another Oxford resident, to pad out this post with some of his beautiful shots of the city. 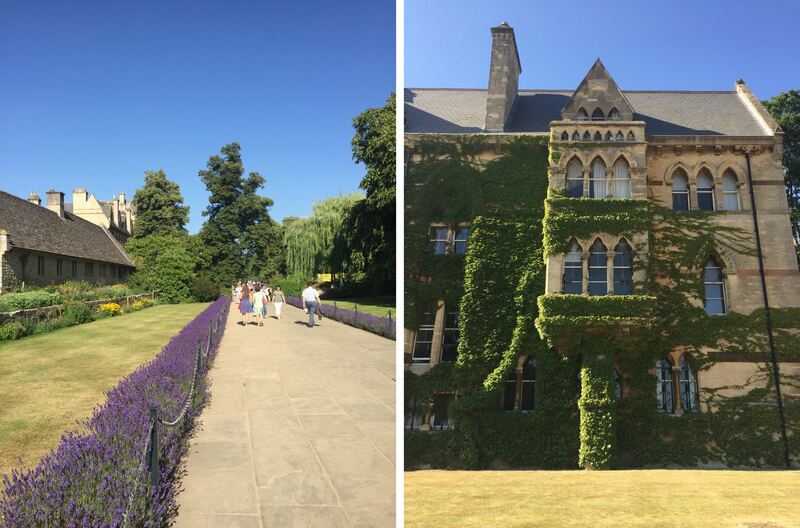 There are loads of reasons to visit Christ Church College while you’re in Oxford. It was founded by Henry VIII, it’s one of the largest colleges in the university, and the second wealthiest (behind St John’s). The quad is the largest in Oxford, the belltower over the main gate was designed by Christopher Wren, and the dining hall was used as the seat of parliament during the English Civil War. Add the fact that it was the filming location for the early Harry Potter movies and the film adaptation of Phillip Pullman’s Northern Lights, and you’ve got a first class tourist attraction. Left: Tom Tower over the main gate into Christ Church college. Right: Tourists queued up. And that’s why you’ll have to queue to get in and pay £10 for the privilege. 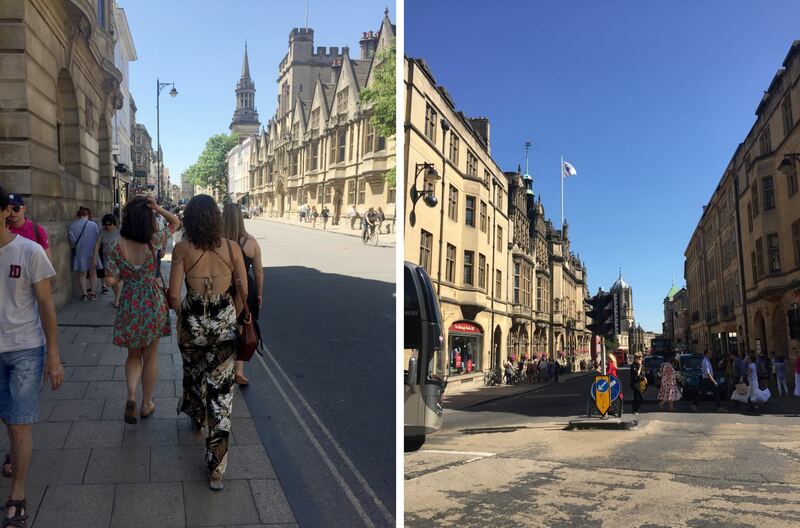 If you have a friend or relative who’s a student at Oxford, use the opportunity to tag along with them for a visit. Left: Christ Church Memorial Gardens. Right: The side of Christ Church from Broad Walk. 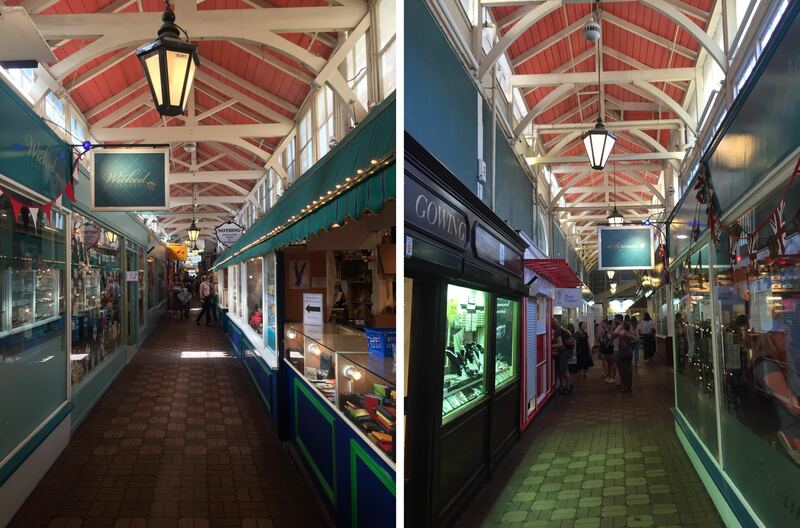 The Covered Market off the High Street in Oxford has been open since 1774! It’s full of food stalls including sweet shops, butchers, greengrocers, bakeries and sandwich shops, as well as jewellery, souvenirs and vintage clothing. It’s a great place to shelter from the hot sun or pouring rain, although it can get very busy! Two of the alleyways in the Covered Market. The chain of Blackwell’s bookshops was founded in Oxford, and you can visit that very first shop on Broad Street. The exterior is deceptively small, as the shop goes underground and spreads out to either side of the shop and even under Trinity College next door! The beautiful Sheldonian Theatre is often the venue for music concerts, but you can enter as a visitor and go up into the cupola in the centre of the roof to get amazing views of Oxford. Known as “the Bod” to students, the Bodleian Library is one of the oldest libraries in Europe and the second largest in Britain, with over 12 million items. Since 2003 it’s been a legal requirement for the Bodleian to get a copy of every new book published! The gargoyles on the Bod are worth looking up for. Stand at the end of New College Lane and look at the one second from left, and you’ll see two dogs caught in a compromising position. Local legend says these horny hounds were left here by a disgruntled architect who had been underpaid for his work. The Radcliffe Camera sits at the centre of a square between the Bodleian Library, St Mary’s Church, Brasenose College and All Souls College, and serves as a reading room for the Bodleian. The only way to go inside is on an extended tour of the libraries, but the outside is beautiful enough to be worth the trip! 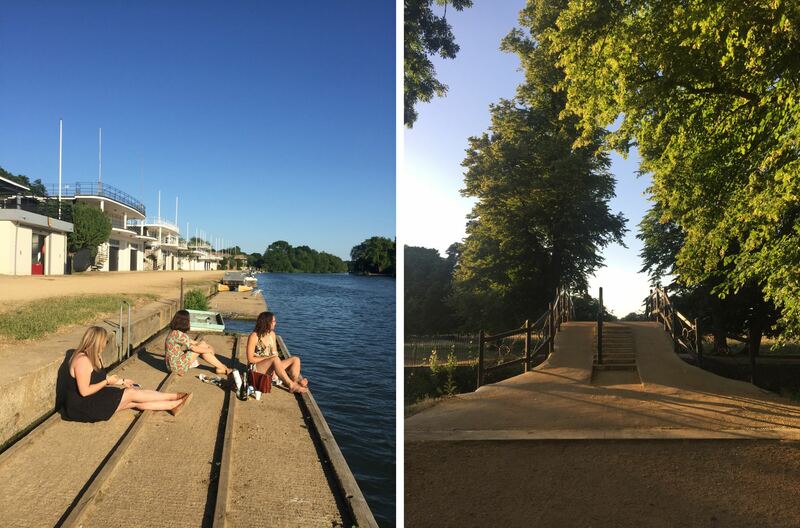 If you find yourself in Oxford on a hot summer day, you must make your way immediately to the Christ Church Meadow which runs alongside the River Thames. Christ Church College from the memorial gardens. You can access the meadow from Abingdon Road via the Christ Church Memorial Gardens, or from the High Street past Merton College. Left: Merton Road. 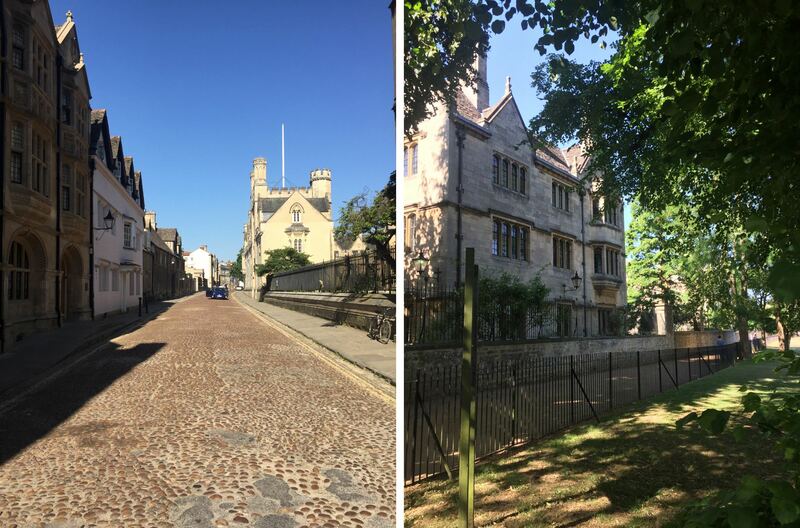 Right: Merton College via Grove Walk. 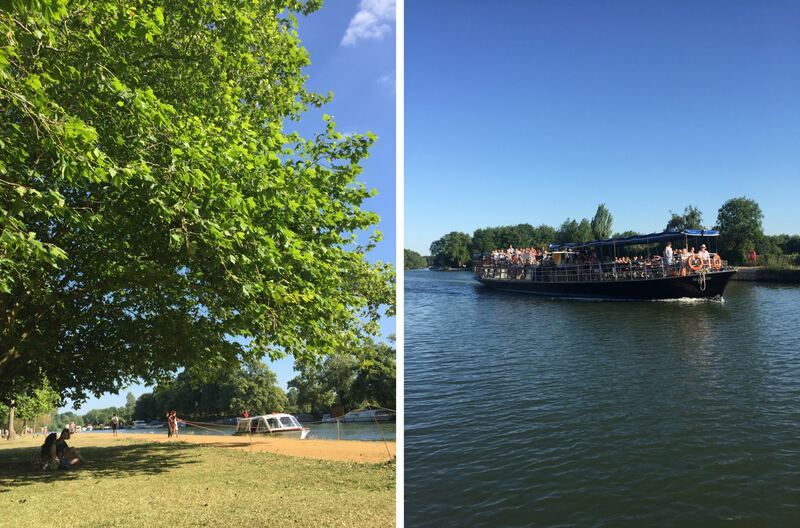 Boats of all kinds are trundling up and down the river next to Christ Church Meadow, from rowing boats and paddle boats to tour boats and canal boats. During summer, students and locals lie on the grass, have picnics and barbecues, and try to fend off the geese. Left: The Thames Riverbank in the Christ Church meadows. Right: Cruise boats on the river. If you keep walking you’ll cross a bridge and find yourself on Boathouse Island, where all the colleges have their boathouses. The jetties are perfect places to relax with a drink and dangle your legs in the water – provided they aren’t being used of course. Left: Chilling on a jetty. Right: The bridge to Boathouse Island. Matt took me to the Museum of Natural History on a weekend trip to Oxford for our second anniversary. It’s a great place to go no matter how old you are, but it’s perfect for kids who like dinosaurs. If you have time head to the Pitt Rivers Museum at the back of the main room. It’s an extensive collection of ethnographic oddities from around the world, like shrunken heads, curses, and witches ladders. Housing drawings by Da Vinci and Michelangelo, paintings by Picasso and Turner, biblical manuscripts, Lawrence of Arabia’s ceremonial dress and Guy Fawkes’ lantern, the Ashmoleon is another museum that’s great for a family trip. Look out for the Alfred Jewel in the Anglo-Saxon section. It’s a gold and rock crystal masterpiece dating from the 9th Century AD under the reign of Alfred the Great. It’s inscription – “Alfred ordered me to be made” – symbolises the king’s authority and makes this artefact one of the oldest surviving indications of royal authority in what was to become England. 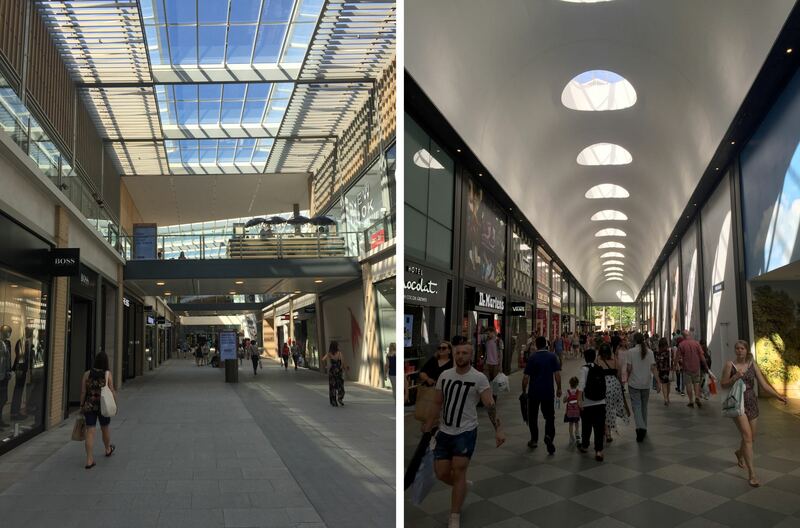 Recently unveiled, the new Westgate shopping centre is predicted to totally revitalise shopping in Oxford town centre. Main entrance to Westgate from Bonn Square. Having been a couple of times it’s probably one of my favourite shopping centres, compared to the crowds in London’s Westfield and the dated modernity of West Quay in Southampton (also why are all these shopping centres in the west?). Not only does it have the standard shops, it’s also got lots of trendy restaurants and one of those plush premium cinemas in the roof. This building is so unusual I thought it was worth adding to the list. It was designed by architects Herzog & de Meuron “to promote open discussion, interaction and collaboration”. Construction finished in 2015, and it received a RIBA National Award in 2016. Its design and height makes it very distinctive from all the other buildings around – pop along to Jericho and check it out. 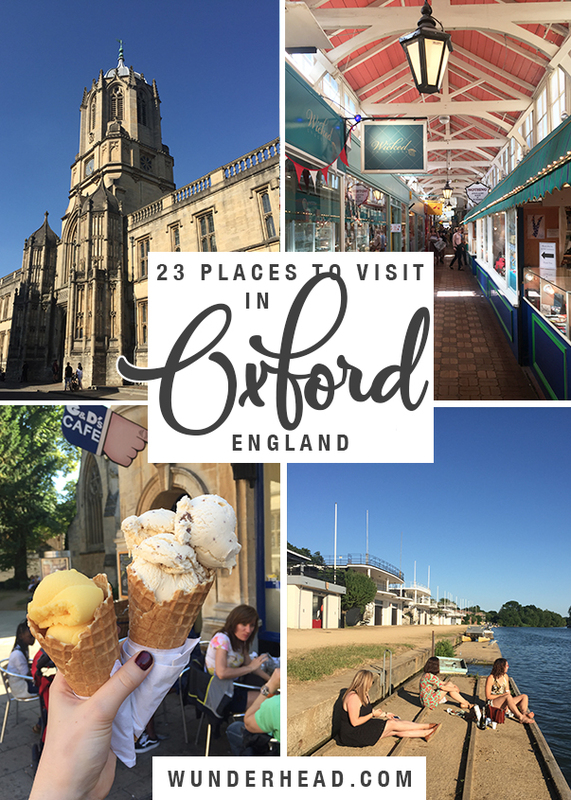 There are loads of great places to eat in Oxford, but here are some of my favourites that I’ve been taken to by Matt, Rosie and Emma. Matt took me to Pierre Victoire on our weekend in Oxford to celebrate our 2 year anniversary. This authentically French restaurant stands on Little Clarendon Street, with strings of lights hanging over head. We ate in the tiny second floor with only about eight other diners, creating a really intimate atmosphere. We were also the youngest by a fair amount – this would definitely be a good place to take your parents. Left: Little Clarendon Street. Right: Selfie inside Pierre Victoire. Our evening was actually filled with drama. That intimate space I mentioned meant we all had first row seats to an intense argument between one of the couples – “I saw you flirting with her! Don’t lie to me!” “Darling I’d never do such a thing, you know I’ll never stop loving you!” – so drunkenly absorbed in themselves that the rest of us were slightly dismayed, unable to ignore them if we tried. Not to be upstaged, I promptly spilt my red wine all over the table. Also on Little Clarendon Street, Al-Andalus has some seriously tasty tapas. Charred padron peppers glittering with sea salt, fluffy croquettes with crunchy golden crusts, buttery goats cheese deep-fried and drizzled with honey… We had so much we could burst. And at the end of the night we had a lovely chat with the Bar’s in house Flamenco dancer about our upcoming trip to Seville. Good food and friendly people, what more could you ask for? 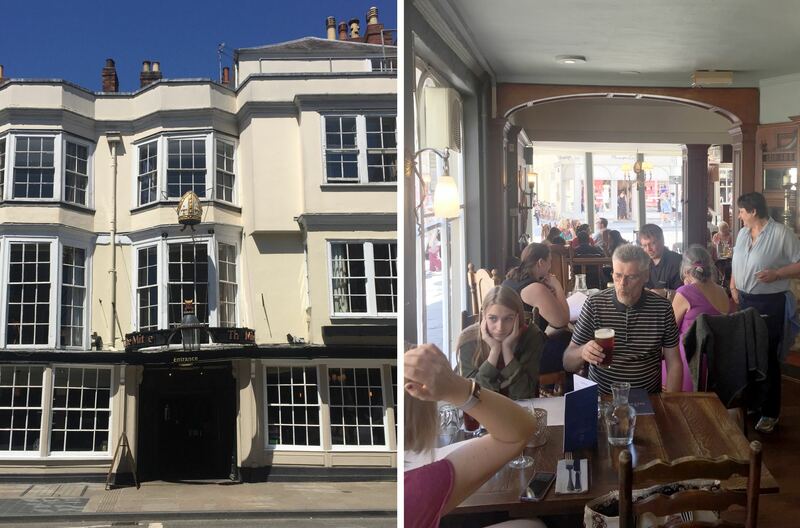 I won’t lie to you, we chose The Mitre for lunch on our girls’ weekend in Oxford because it was showing the world cup. But the food was very satisfying, with drinks menu was extensive, and the service was great. One of our family’s regular lunchtime haunts while my sister was at Exeter College, Turl Street Kitchen has one of those trendy, no-day-is-the-same menus. As a social enterprise it has lots of sustainable initiatives, uses local and seasonal produce and donates to charity. I’ve heard it has very good breakfast too. Another stop on our anniversary trip – The Old Bookbinders in Jericho, a classic cute little English pub. Board games crammed into every shelf and crevice, commemorative beer mats stuck above the bar, lots of exposed wooden beams. I was still full from breakfast, so I controversially had something from the dessert menu – a cheese board! 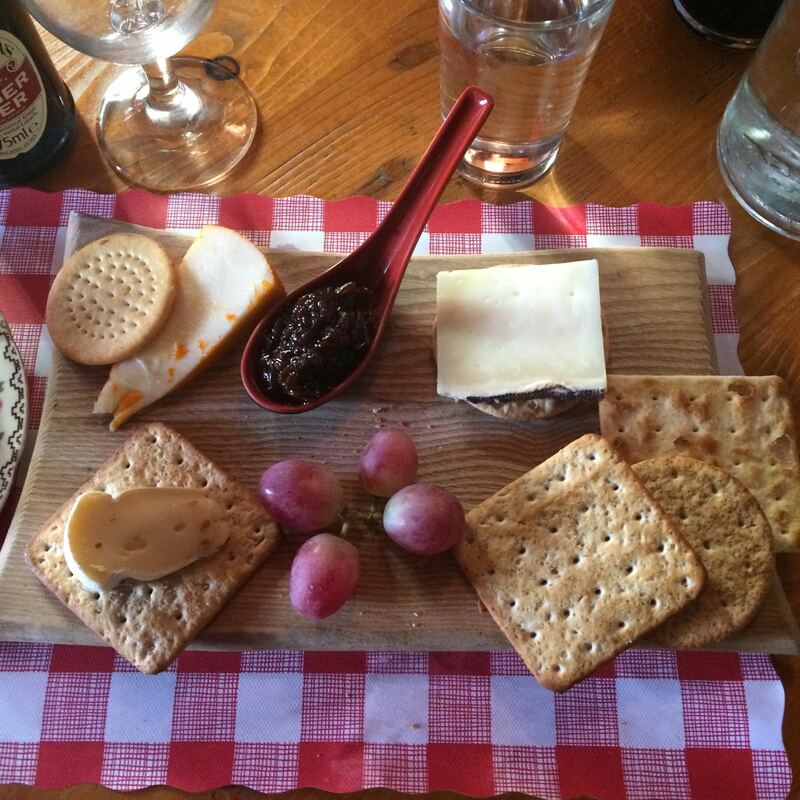 The cheeseboard at the Old Bookbinders in Jericho. 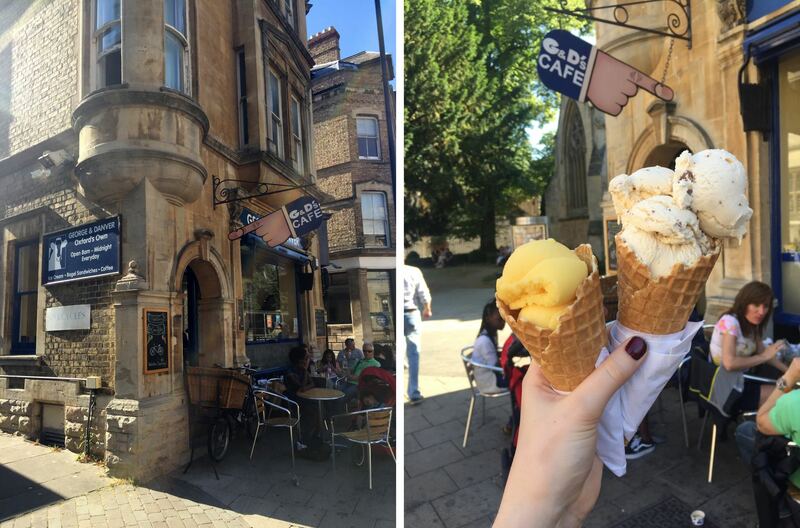 You can’t go to Oxford without trying G&D’s Ice Cream, especially not in the summer. 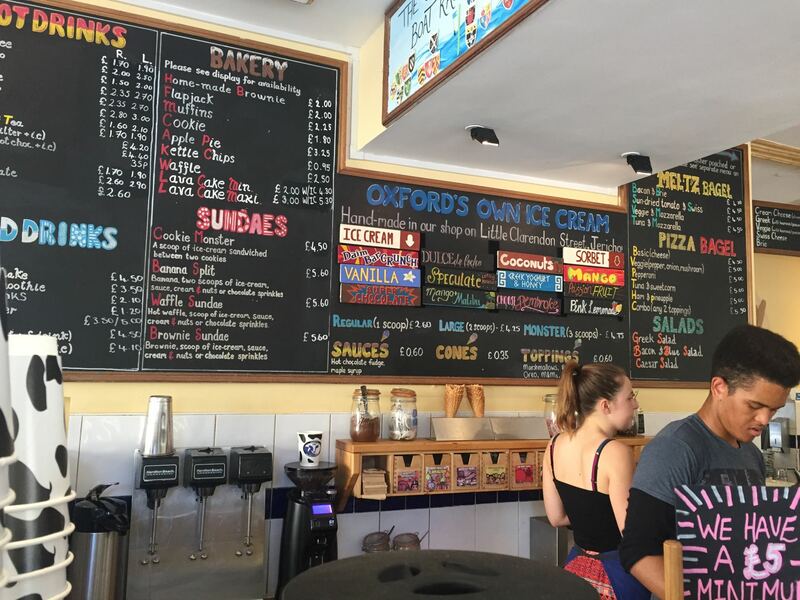 Established in the early 90’s by an Oxford University student (George Stroup, the “G” in the name), each branch served delicious handmade natural ice cream, as well as hot drinks and baked goods. 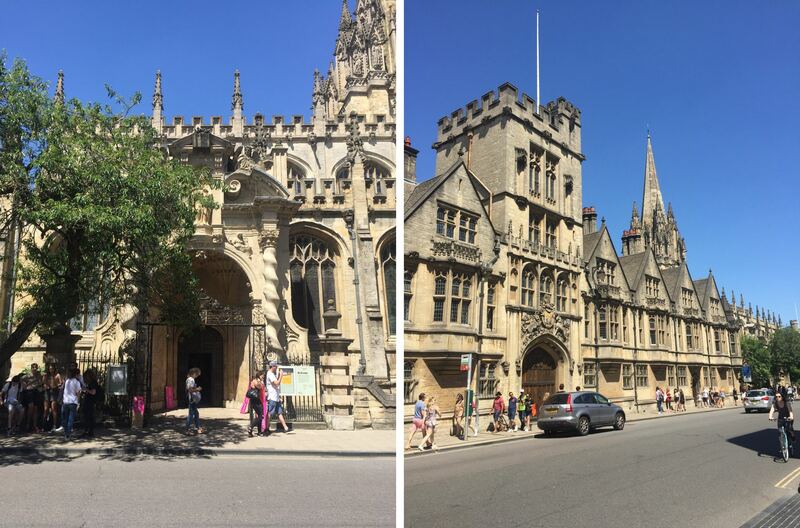 On our girls weekend we visited the G&D’s opposite Christ Church College, and enjoyed our ice creams as we walked down to the river bank. Left: G&D’s Cafe. Right: Single cone of passionfruit sorbet, double cone of Diam. Another of our family haunts, the Vaults and Garden Cafe can be found underneath the University Church of St Mary. It’s invariably very busy, but the scones are fantastic buttery crumbly things and makes the queue worth the wait – although the architectural setting is definitely the highlight. Matt took me to Green’s Cafe for breakfast on our anniversary weekend, where I had a delicious stack of pancakes and a smoothie. The atmosphere in the cafe is very homey, like you should be able to walk in and say “the usual please”, almost as though it’s a secret. If you want to get away from the crowds and the tourists, this is the place. A great choice if you’re after an outside drink, The Bear Inn has a nice patio area at the back with picnic benches in the sun and the shade. We enjoyed a happy afternoon here playing Monopoly deal. 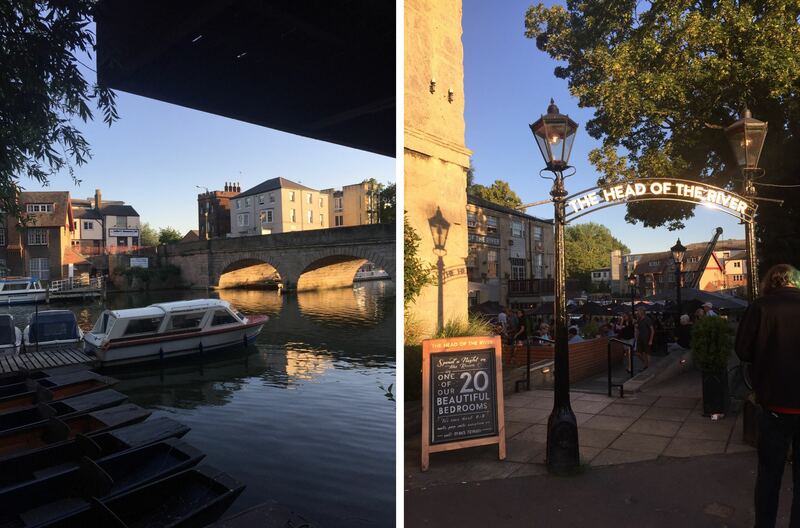 A bit of a honeypot, Head of the River is unsurprisingly popular because of its amazing location on Folly Bridge over the River Thames. If you can fight your way to a table this is a lovely place for a drink in the sun. Left: Folly Bridge. Right: Head of the River pub. The Duke of Cambridge is a trendy cocktail bar on Little Clarendon Street. It’s very popular but if you hang around long enough you’ll probably manage to blag yourself one of their comfy cushioned booths. Cape of Good Hope sits on the roundabout at the end of Cowley Road, and has a really nice outdoor area… that we glared at jealously from inside because it was closed. 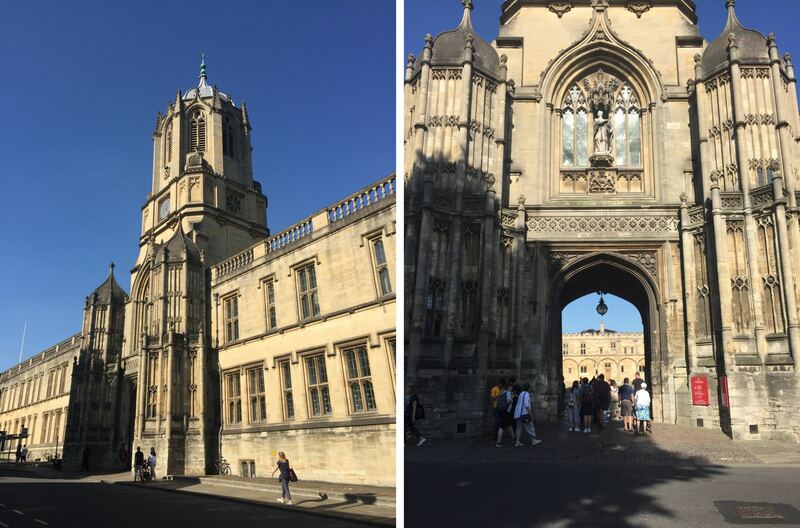 Oxford is such a nice day trip, especially from London – there’s tons to do whether you’re a history buff, a dating couple, a family looking for fun, or a group of friends chilling out. 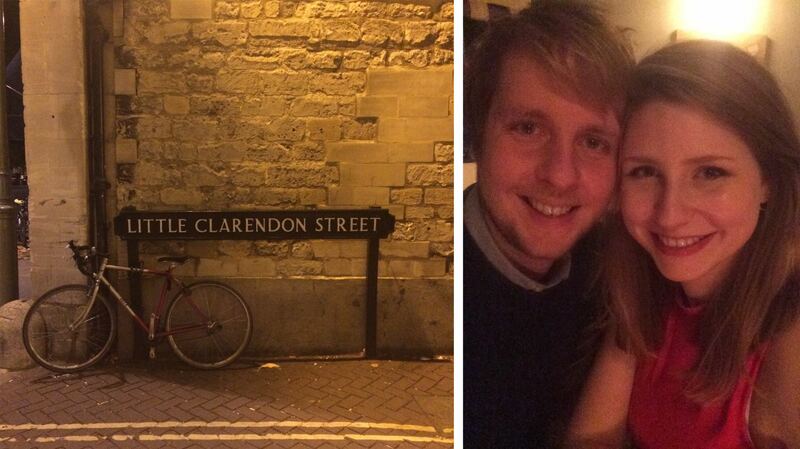 If you love Oxford too I’d love to know where your favourite hang outs are!